Christopher Burge began his musical career during his years at The Ohio State University, where he studied saxophone and music theory with Gene Walker and Hank Marr, graduating with a Bachelor of Music in Jazz Performance in 1997. During that time, Christopher performed with many musical groups, both on campus and off, toured Thailand with free-jazz group “Honk, Wail, and Moan”, toured Europe with the OSU Jazz Ensemble, played on a USO tour of maximum-security prisons, and performed with Barry White, Louie Bellson, Stanley Turrentine and The National Black Music Caucus Big Band, and the Lawrence Welk Orchestra. 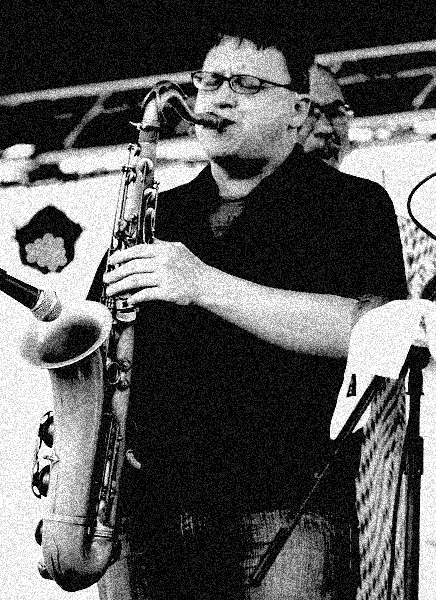 Since moving to Cleveland in 1998, Christopher has continued to perform with groups of various styles, including Ernie Krivda and the Fat Tuesday Big Band, The Cleveland Jazz Orchestra, The Jazz Heritage Orchestra, and The Rock and Roll Hall of Fame House Band, Cleveland-based musicians such as Evelyn Wright, Helen Welch, Dave Sterner, Ray Porrello, and Bill Ransom, and nationally known artists David Sanborn, Cyndi Lauper, Mavis Staples, Ronnie Spector, David "Fathead" Newman, "Little" Jimmy Scott, Bobby Caldwell, Benny Golson, Eddie Holman, and Nancy Wilson. Christopher also is active in the recording studio, playing saxophone, flute, and clarinet for American Greetings e-cards, and is heard on the theme song of the WVIZ-PBS show "Applause". Currently, Christopher teaches saxophone at Skyline Music in Westlake, Ohio, and performs regularly with his own jazz trio (formerly known as the "UP ensemble"), the blues-swing band Blue Lunch, and many others.